When Fisher-Price got in touch to ask if we wanted to review the latest jumperoo, the Laugh and Learn Puppy’s Activity Jumperoo, I said yes immediately – knowing that the jumperoo is one of the few products that has truly made a difference to our day to day lives with a baby. The day we bought our Fisher-Price jumperoo remains vivid in my mind as one of the lasting memories of adjusting to life with my first baby. I remember standing in Argos, clutching my nectar card, wondering if it was going to be worth using up all my points. I remember running through the justifications I would give to Sam, for why I had bought this thing, during a time when we were trying not to do much spending at all. Fast forward six years, and our faithful jumperoo has seen us through three babies, and is still going strong. But now there is a new jumperoo on the block, the Laugh and Learn Puppy’s Activity Jumperoo – and Otto has been tasked with the important job of putting the new model through it’s paces. A jumperoo is a free standing frame with a seat in the middle that lets your baby jump and bounce safely, whilst strengthening their gross motor skills. 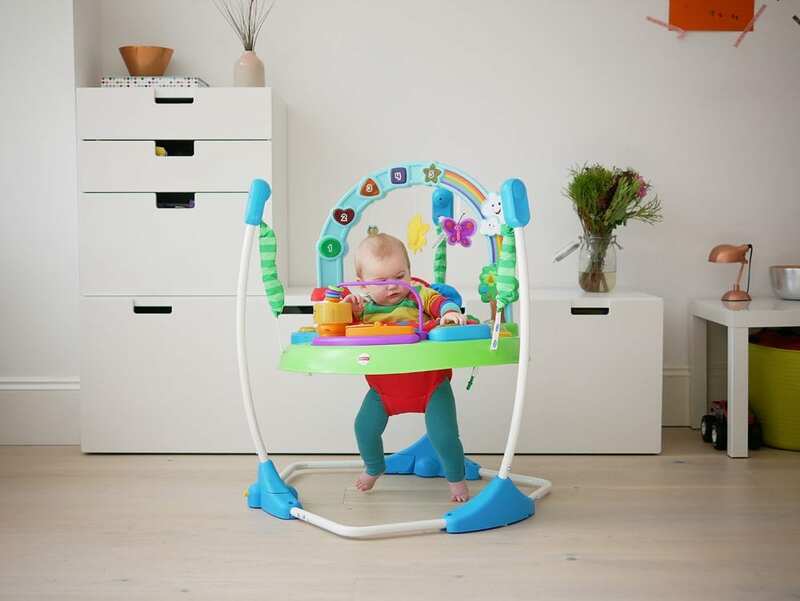 The seat rotates 360 degrees, with things to play with all around the circular frame – babies soon learn to spin around themselves to get to whichever toy they want to reach. The jumperoo that we had for years was the Rainforest Jumperoo. 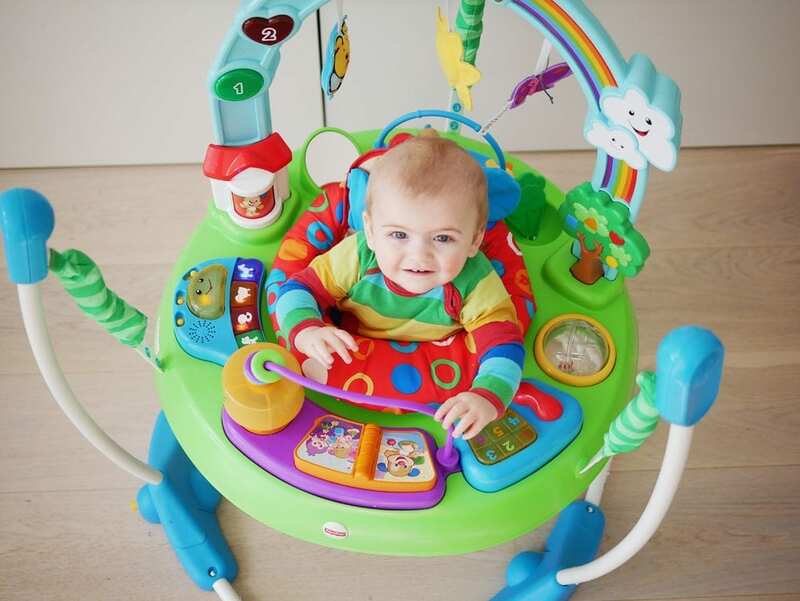 Otto is now using the latest version, the Laugh and Learn Puppy’s Activity Jumperoo. The Laugh and Learn jumperoo is definitely an upgrade. There are more toys, more things to play with, and more buttons to push. The fabric butterfly that was a favourite with all of my children has been replaced with a plastic tree – it doesn’t yet seem to have quite the same appeal as the butterfly, which all of my children LOVED to chew, but it’s a welcome change for me as it’s much more hygienic and easy to clean. Early Learning mode on the Laugh and Learn Puppy’s Activity Jumperoo features a singing voice. But when you find yourself yearning for a break from singing along to every word, you can switch it to Musical Fun mode, which is just music and sound effects. Another feature of Early Learning mode are the spoken songs, animal sounds and first words in English, Spanish, Italian and Russian. The big rainbow arch is really fun and bright, and I prefer it to the dangling animals on the Rainforest Jumperoo that used to either hang just out of reach of my babies’ hands, or dangle annoyingly close to their face. There are dangly shapes on the rainbow, you pull them to activate music and lights – much more interactive than the older model. A car moves along a short track, and a light turns on and off when pushed. These are both nice additions, and ones that Otto tends to gravitate towards. Is a jumperoo worth it? 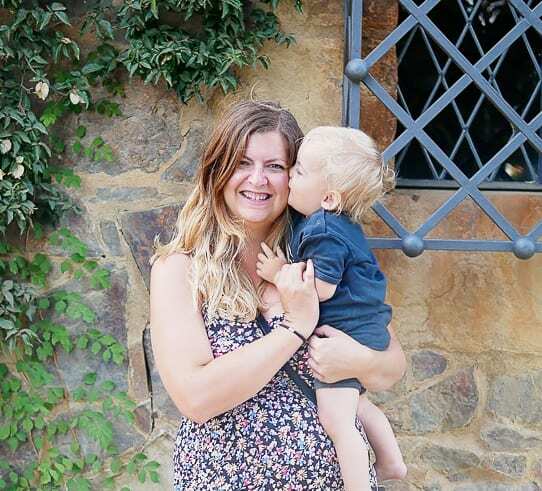 There are so many baby items on the market, I know from first hand experience that it can seem bewildering to know which ones are worth getting, if any. It’s somewhat scary to invest in anything that you know your baby will ‘only use for X amount of months’. This is exactly how I felt six years ago when I stood in that queue with my nectar points. But what I couldn’t see then, was that my jumperoo purchase was an investment. A jumperoo is well constructed and will last a long time. Our original Rainforest Jumperoo has lasted through three children. When your baby days are behind you, your jumperoo will fetch a decent resale value, as they are so popular. The jumperoo is without hesitation a product that I can recommend to every new parent. Six years ago, we purchased a jumperoo for our first baby. Now, both Sam and I list the jumperoo within our top 3 must-have baby items. Our jumperoo has kept our three babies happy during a tricky age where they are increasingly inquisitive and seeking extra stimulation. I can’t begin to put a price on all the extra minutes of hands free time that our jumperoo has bought us over the years. Hello I just set up my puppy’s activity jumparoo and I can’t figure out how to fold it down unless I take it apart. I just bent the legs slightly in is that what is classed as space saving!? I would love your help please!